Discover this magical yet remote coastline with legendary Kimberley expeditioner, Mike Cusack on the Coral Princess. In 1987, Mike and his wife Susan were chosen to be the first Australian Geographic's Wilderness Couple. Mike will share his experiences with you of this once forbidding ancient and forgotten land. Unlock her secrets in over one thousand miles of towering cliffs, plunging waterfalls, and beckoning white beaches which will touch your soul like no where else on Earth. After a remarkable wet season this year, Kimberley will be at its best for the start of Aurora Expeditions' thirteenth season. Join Mike on the Kunmunya 'Wilderness' Walk, exclusive to Aurora Expeditions' passengers. 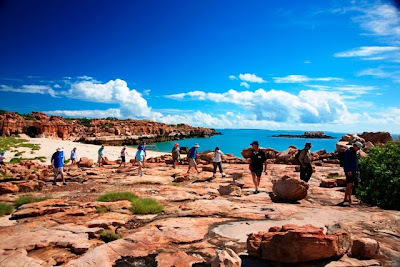 The optional 9.5 km, or seven hour, rock-hopping journey is an inspirational and authentic bush experience, and one of the best ways to discover the true heart of the Kimberley. With such an isolated coastline, many of the Kimberley Coast's most fascinating sites can only be accessed by sea. Passengers will visit islands with nesting boobies and frigate birds, revel in the amazing Montgomery Reef, uncover the ancient secrets of Aboriginal rock art galleries and participate in the excitement of spotlighting saltwater crocodiles. Carved by millions of years of extreme tidal patterns, complex river systems, waterfalls and freshwater swimming holes complete the Kimberley delights. The voyages will also be joined by eminent indigenous art historian Garry Darby and the inimitable Chris Done, whose years of research as a naturalist bring the wonders of the Kimberley Coast to life. As with all Aurora Expedition's voyages, emphasis is placed on a combination of interactive experiences with the environment and a strong educational element. Our onboard team of lecturers and naturalists are Kimberley experts who interpret history, plants and animals from Aboriginal and European perspectives. Departures still available in May and June 2011. These unique expeditions travel from Broome to Bigge Island off the Kimberley's northwest coast and back again. Along the way travellers will see the Lacepede Islands, a prime breeding ground for green turtles and tens of thousands of breeding birds; the tidal pools of Montgomery Reef; and the secrets of the Wandjina spirit paintings. The third voyage explores from one end of the Kimberley Coast to the other, crossing Joseph Bonaparte Gulf and visiting the spectacular King George River on the north coast. Cruising north, expeditioners will explore the renowned Horizontal Waterfalls, the shark, turtle and whale rich waters of Montgomery Reef, Prince Regent National Park and the spectacular 90 metre plunge of the King George Falls. Prices are from AU$6,950 per person twin-share, including all meals on board and Zodiac excursions. Solo travellers are welcome. Special offer - Simply book on any of Aurora Expeditions' 2011 Kimberley voyages before 31 March 2011 to receive a FREE accommodation and Minyirr Park tour package valued at $300. Conditions apply.